Obviously as a fan of the Anime, which is pretty flawed but at the same time almost perfect, I felt the need to peruse the light novel. Where it covers the same ground it is almost scene for scene the same, however concentrates almost exclusively on the relationship between Kirito and Asuna. As such it is very much focused on the love story between the two and pretty much ignores the side stories and distractions. I don't believe this does any harm to the flow, but does perhaps have a little less impact that the anime. 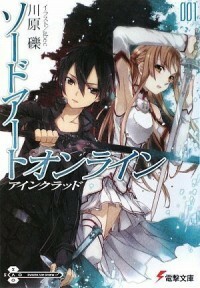 I think perhaps because the love aspect is more explicit than in the anime - the subtly of which I liked a lot, and maybe because Asuna does not appear as strong. That said I enjoyed it plenty enough, the romance is certainly written from the perspective of the kind of gamer who would appreciate the anime - lots of sword fights and related worry (and we find out how Asuna ended up in SOA anyway - one of those puzzles never explained in the anime). I will probably end up working my way though the later installments (some of which are covered in the anime too), so not a bad read at all.